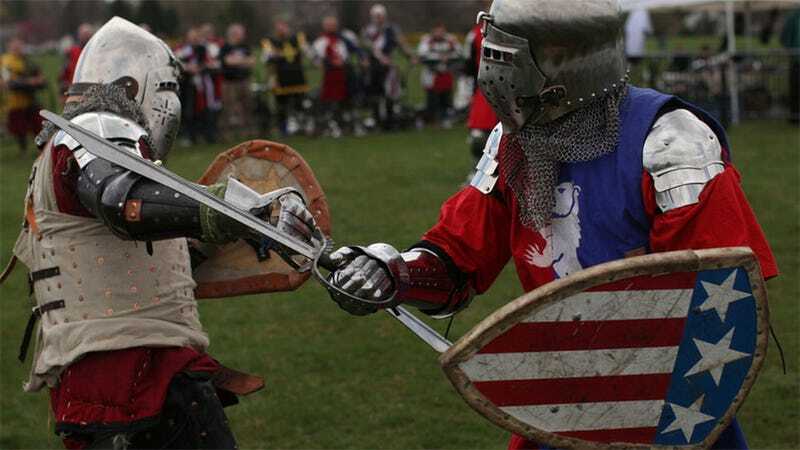 This week, the worlds of role-playing, live-action role-playing, cosplay and military re-enactment will collide in France at the first ever Battle of the Nations, a "world championship" for medieval combat. Held in Aigues Mortes, 22 nations will be taking place, from the obvious (France, Britain, Germany) to contestants from places that aren't even real nation states (Quebec). Even far-flung colonies like the USA and Australia have sent teams. The competition originated in Eastern Europe, but this year will be the first time contestants from all over the world have joined in. You can see some footage of an earlier event below. Game of Thrones this ain't. There's a great profile in the New York Times on the American team, including news that it will be taking a support team of over 50 people, including a "psychologist specializing in head trauma, cooks, armorers, knight marshals, squires and a masseuse". The competition is spread over multiple events, ranging from 1v1 duels to "mass battles", which pit "armies" of 21 combatants against each other. The action begins today, May 9, and runs all weekend.